Learn tips for success and what you should be doing right now to get a head start on the Fall 2019 Reporting Cycle. Did you receive a letter or email for feedback on entitled assets from a deceased owner? Learn about holder implications in the wake of the Overstock decision.  Ensure compliance with all state escheat laws with Keane’s annual unclaimed property reporting services. Keane’s specialists allow organizations to manage due diligence mailings, file accurate final reports, & plan for future reporting cycles while minimizing strain on internal resources. Protect your at-risk shareholders, investors, & account owners through Keane’s integrated location and communication programs. With advanced data analysis & genealogical expertise, Keane’s services go above & beyond the industry standards to safeguard your customers’ assets. Address your unclaimed property compliance challenges head on with the support of Keane’s National Consulting & Advisory Services team. Identify your risks, mitigate liabilities, and defend against audits with Keane in your corner. Keane is the number one provider of unclaimed property communications, compliance and consulting services in the country. From customized communication programs and data analysis, to in-depth unclaimed property services, state unclaimed property reporting, escheat consulting and annual compliance reporting, Keane Unclaimed Property provides corporations, mutual funds, banks, brokerages, insurance companies and transfer agents with a depth and breadth of services that is unmatched. Keane helps clients reduce costs, protect shareholders, or retain customers while successfully navigating the complexities of unclaimed property regulations.